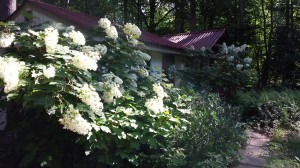 My amazing oakleaf hydrangeas are very prolific with flowers this year. My Summer Garden is beginning to bloom. Each year I wonder what will survive and what will thrive. We had a pretty nasty long cold winter this year. Lots of snow and ice and cold weather that lingered about two weeks longer than normal. So far, it appears that some plants did very well with the additional precipitation and cold air, and others didn’t do well at all. 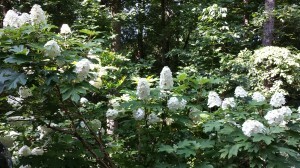 One example of a plant that did well — my oakleaf hydrangeas. 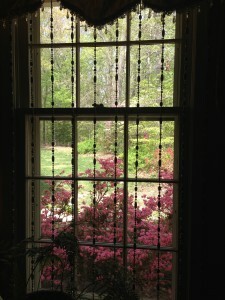 Take a look at the abundance of flowers. 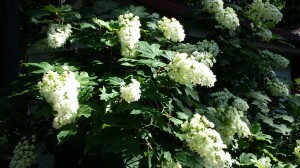 I have a number of oakleaf hydrangea plants. Most are the “snowflake” variety with huge showy double flowers up to 24 inches in length! I have two “snow queen” plants with smaller more upright flowers. Oakleaf hydrangeas lose their leaves in the fall yet their stems look like “peeling bark” for winter interest in the garden. 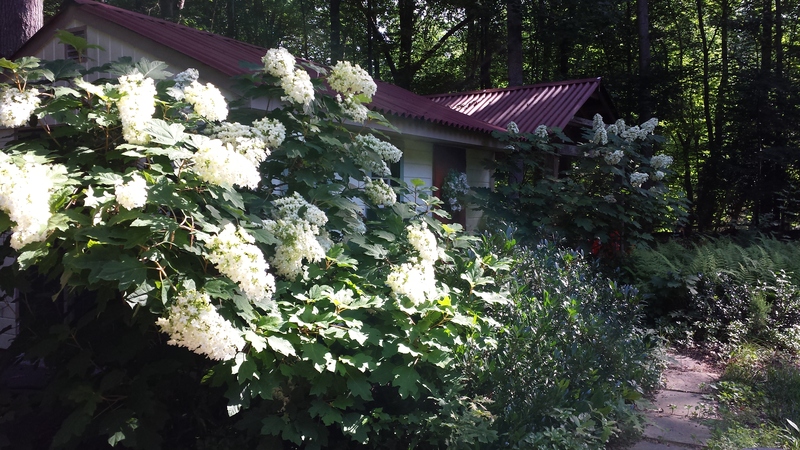 Huge oakleaf hydrangea flowers are bee-attractants. This is just one oakleaf hydrangea plant! 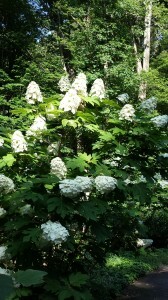 Oakleaf hydrangeas have showy flowers, are deer-resistant, and like shady gardens. Another surprise for me this year includes the blooming of a purple loosestrife plant. It’s been in my garden since 1998, and it was sitting in a pot prior to that. This poor plant is loved by the deer population and has only flowered two or three times since it was planted. This year it flowered!!! 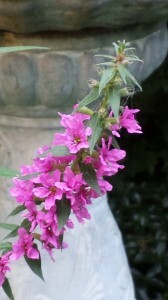 Purple loosestrife is reportedly invasive. The deer in my neighborhood have certainly kept down the invasive nature of this plant by eating its flowers. 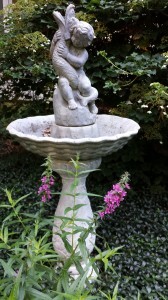 Purple spires bloom next to the fountain. Another favorite plant is the spirea. I love the feathery look to the flowers. Spirea seems to be a bee haven, as it’s covered by all sorts of insects when in flower. I have two types of spirea. One is Spirea “Gold Flame” which has a nice deep pink flower with chartreuse leaves. 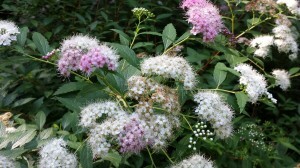 The other type is Spirea “Shirobana” with a combination of white, light pink, and deep pink flowers all on one plant. Spirea is not seen in a lot of gardens in my area, and certainly becomes quite the conversation piece. Spirea bushes look great in a mass planting. Pretty pink and white spirea in bloom. Love this bush! My Lady in Red hydrangea has taken off this year. 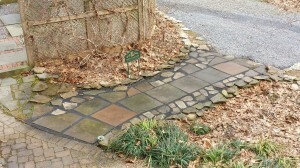 I pruned it back severely in the Spring, or so I thought. 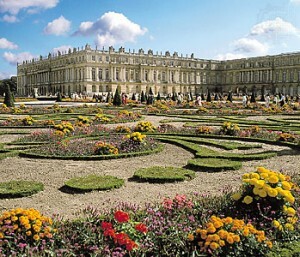 It’s full of blooms that start out blue, turn to light pink, and then to a deep red later in summer. Lady in Red’s stems are a deep red which makes it unique for winter interest in the garden. And this plant spawned four “babies” that I have moved to other areas of the garden. My other hydrangeas did not fare well this winter. 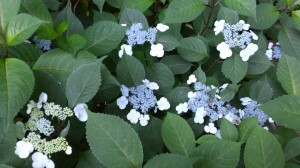 With the exception of the Pee Gee hydrangeas, they all died back to the ground. Nikko Blue and Mother’s Day will likely not flower again until next year. 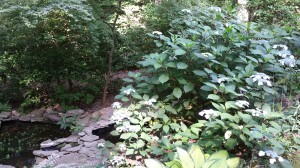 The Lady in Red hydrangea is blooming alongside the ponds. Lady in Red Hydrangea first blooms in blue then the flowers change to pink and then a deep red. She also has red stems. Love this plant! Next to bloom will be my buddelia — butterfly bushes. I have white, lavender, and deep purple butterfly bushes. They reseed themselves as well, so babies will abound. The butterflies and bees love the butterfly bushes and the flowers have a very sweet fragrance. 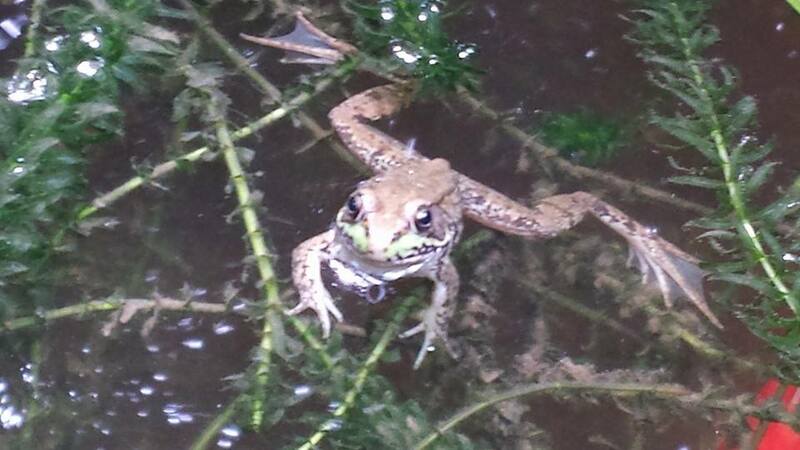 Also, indicative of summer are the tadpoles in the whiskey barrel pond. 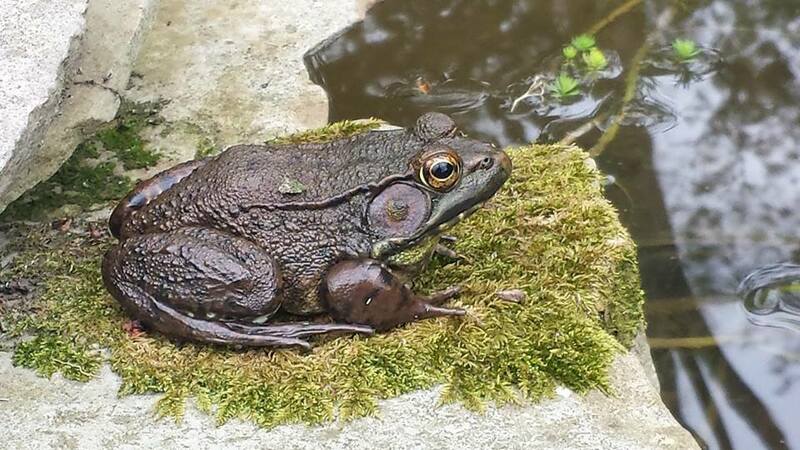 There are maybe 20 tadpoles of several kinds of frogs including tree frogs and wood frogs. 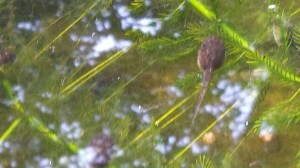 So far, I haven’t yet seen evidence of baby fish in the other ponds. Time will tell. What’s happening in YOUR summer garden? Leave a comment and let us know!! !